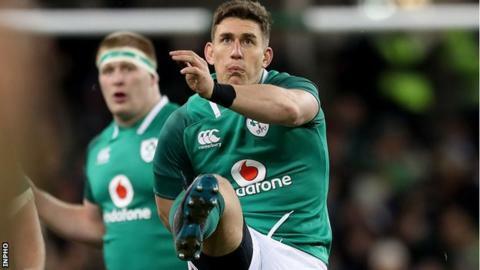 Ireland international Ian Keatley has agreed to join Italian side Benetton Rugby at the end of the season. Keatley, 31, who can play centre, fly-half or full-back will move to Treviso following an eight-year Munster career. The Dublin-native trails only Ronan O'Gara on Munster's all-time scoring list with 1,247 points from his 180 games for the province. Having made his Ireland debut against Canada in 2009, Keatley has scored 37 points in seven Test appearances. "I am very happy to start a new chapter in my career at Benetton Rugby. This is a fantastic opportunity for my wife and daughter to experience something very different," said Keatley. "At this moment Benetton is one of the top clubs for achieving something special and I want to be part of this exciting journey. "I also believe that with the excellent work being done by the staff and my new teammates we can contribute together to achieve many successes." He will join fellow Dublin-native and former Leinster teammate Ian McKinley in the Benetton squad, with McKinley and Tommaso Allan both expected to be part of the Italy panel at the Rugby World Cup later this year. "Right away Ian was informed about our project and objectives, and as happened with [flanker Dewaldt] Duvenage he married the idea of ​​being a constant support for our younger players to help them in their growth path," said Benetton Rugby director of sport, Antonio Pavanello. "In a particular season like the next, given the numerous commitments of the Italian national team and the players that we may lose then, we are sure that Keatley will bring experience and solidity in several positions in the back line." Connacht have moved to increase their front-row options for next season with the signing of loose-head prop Paddy McAllister from Gloucester. The former Ulster forward, 29, will return to Ireland following a four-year stint at Kingsholm where he has made over 50 appearances for the Premiership club. An Ireland Under-19 and Under-20 international, McAllister left Ulster in 2014 to join French side Aurillac and made the switch to Gloucester the following season. The Lisburn-native will provide competition for first-choice loose-head Denis Buckley in the Connacht squad next season. Glenn Irwin says his Kawasaki is "suited to his style of riding" as he begins his bid to win the British Superbike title this weekend.